Between its progressive attitude towards recreational drugs, the red light district and a laundry list of other "pragmatic tolerances," Amsterdam often gets a bad wrap among many. If you've never been before, let's set all pre-conceived notions you may have aside. 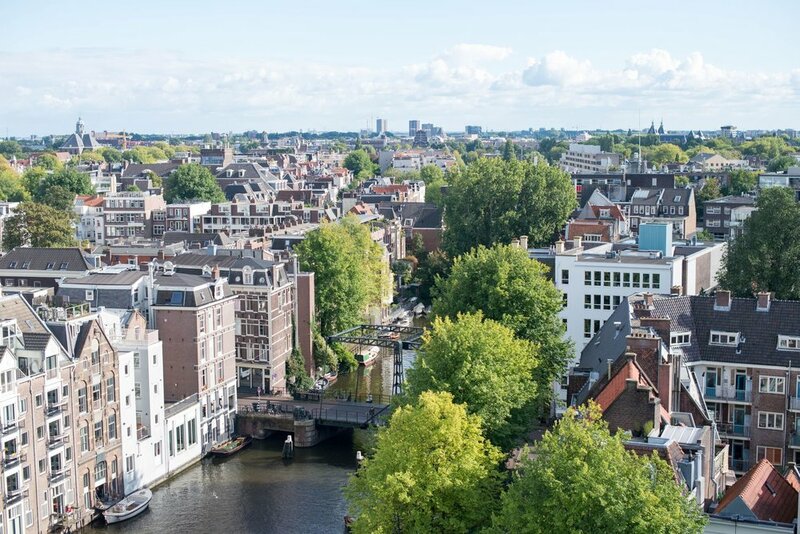 I'm here to argue that regardless of your position on any of these aforementioned issues, you're likely to find Amsterdam to be an incredibly charming and wonderful city (one definitely worth visiting). It was love at first sight for both me, as well as my friend Sarah who I was traveling with. We agreed Amsterdam was one of the must underrated places we've ever been before: the canals, the architecture, the plethora of bicycles... it's all even more picturesque than you can capture. The few short days we spent there were pretty much perfect in my book, but I know there's even more to do that we didn't have time for. So no matter when you go or what you're looking for- be prepared for Amsterdam to steal your heart + leave you surprised in the best way. Layers are the name of the game in Amsterdam. No matter what time of year you visit, the climate tends to be rather mild (average temperature of 17°C / 63° F in the hottest months and 3°C / 37°F in the coldest). It's also known to rain a good bit, so as the Boy Scouts would say, #BePrepared. I wore a scarf every single day we were in Amsterdam. It's arguably the easiest light layer to put on/take off if you're a bit chilly/ warm. Opt for light weight linen fabrics (here and here) if you're visiting in the spring/summer and warmer cashmere or wool (here and here) in the fall/winter. Amsterdam is an extremely walkable city. We got everywhere by foot (or bike!) so leave the heels at home. I'd advise a pair of athletic shoes that pair well with jeans, a pair of ballet flats you find comfortable to walk in, a pair of ankle rain boots (just in case) and then some booties (also here) with little to no heel. Again with the layers... No matter when you visit, be sure to bring some form of outerwear. Given it's temperate climate, I'd advise a light weight trench (also here or here), a rain jacket, a leather jacket (also here), and either a long cardigan if you're visiting in the warmer months or a pea coat (also here or here) if you're visiting in the cooler months). Haley bought me this Aspinal of London currency pouch and passport case (both of which I'm obsessed with). The currency pouch is especially useful anytime you're traveling somewhere with another currency (it has pouches labled $, €, £ and an extra blank one to categorize however you prefer. Given that Amsterdam is so walkable/ bikeable, you're likely to be on your phone quite a bit (maps to navigate, camera for photos, etc.) I'd advise an external charger to keep your battery charged all day. Hotel V is an Amsterdam family company, run by 12th generation Amsterdammers who have a great passion for the authentic and inspiring character of their city. Want to get to know Amsterdam the way they do? Check out one of their 3 properties during your stay. Hotel V Frederiksplein is in the bustling neighborhood of De Pijp with tons of places to eat + shop (and just steps away from the Heineken Experience). Hotel V Nesplein is just steps away from Dam Square on Amsterdam's popular street, The Nes. This property is an urban inn with an edge that allows you to easily explore all corners of the city by walking, tram or bike. We stayed at their newest property, Hotel V Fizeaustraat. This property is the furthest from the "city center" however it offered us a unique, quirky and hidden side of Amsterdam that we would have never seen otherwise. Many of the amazing restaurants I found (see below) were just around the corner from us at Hotel V Fizeaustraat. It was my impression that this area is a bit "off the beaten path" in terms of tourism, which offered us a really authentic look into life in Amsterdam. From the moment we walked in, I fell in love with the decor (kind of a contemporary 70's atmosphere with a dash of glamour). Their restaurant where you can eat breakfast, lunch and/or dinner offers the finest dishes, the choicest wines, and surprising cocktails. Our room was equally as pleasing aesthetically as the rest of the hotel (I wanted to send all the furniture to my place back home!) The toiletries provided were all wonderful (none of that cheap stuff that smells weird) and Sarah and I both agreed it was the most comfortable bed we slept in during the entire time she was with me. I loved so much about Hotel V (the decor, the breakfast, the amenities and the wonderful staff). They're a great place to stay whenever you plan a trip of your own! We ate like QUEENS in this city. It was one of those trips I wished I could open a trap door in my stomach to make more room so I could keep eating. For starters THOSE WAFFLES! A stroopwafel is a traditional Dutch treat made from two layers of baked dough with a caramel-like syrup filling in the middle. Remember when I said you could pack a regular size suitcase? Aside from the layers, that was also so you can bring lots of stroopwafels back (and I'll go ahead and give you my address so you can mail some to me too). But Amsterdam doesn't stop the waffle game there. They have big Belgium-style waffles in sidewalk cafes everywhere. These guys can be served plain, with strawberries + nutella (my go to, or even with a white-chocolate glaze and sprinkles (as pictured). My advice? Eat as many as you can and try every flavor. We did a chef's tasting to try all ranges, and they were all delicious. Everything tasted fresh and had a unique, distinctive taste that stood out from the ordinary. Aside from the yummy food and dreamy atmosphere, it's located just outside the city center for a bit more of a "local" feel. Still need convincing? You'll also find it at the top of the list of Eater's "13 Hottest Restaurants in Amsterdam Right now." We had an incredible lunch one afternoon at De Kas restaurant & nursery (a short walk from Hotel V Fizeaustraat). It was a bright + sunny day, and we relished in the fact that their restaurant is housed right inside a bright + airy greenhouse (which belongs to the Amsterdam Municipal Nursery). They believe that food tastes best when it's prepared with the freshest, local ingredients-- so they grow their own herbs and vegetables right there on site (and you can taste the difference). The menu is created daily based on the harvest of their own nursery. The cooking style is inspired by the cuisines of the rural Mediterranean (while their fresh local vegetables play an important role). The flavors are light (yet delicious) and the presentation is beautiful (yet simple). De Kas also boasts quite an impressive history. In 2001, top chef Gert Jan Hageman (who had earned a Michelin star in Dutch haute cuisine) decided to repurpose an old greenhouse that was due to be demolished. Today, that greenhouse is now an oasis of calm for the fifty-thousand guests who dine there each year. While both Restaurant C and De Kas are a bit outside the city center, both offer incredible dining experiences and a unique take on Amsterdam that make it well worth the "trip" (under a 10 minute cab ride). Mata Hari: a trendy restaurant in the heart of the red light district. Cafe Luxembourg: relaxed cafe with traditional Dutch snacks. Casa di David: delicious Italian overlooking the canals. Upstairs Pancake House: Dutch pancakes (that supposedly inspired a Beastie Boys song). Blauw: Awesome Indonesian food (which Holland has been known for since the tea trading days). Febo: If it's late in Amsterdam and you're not eating fried food out of a wall, you're doing it wrong. (I actually did get to try this gem late one night, and it was the stuff 2am dreams are made of). I knew I wanted to do a boat tour when I planned my trip to Amsterdam (there are even more canals than Venice!) A friend of mine pointed me to Private Boat Tours and I'm so thankful she did. This was hands down the most fun thing that we did and something I'd highly recommend to everyone. For starters, seeing Amsterdam by canal offers a unique perspective you won't see by foot, bike or car. While there are plenty of tours available, none of them offer the personalization or luxury experience you'll receive with Private Boat Tours (if you don't believe me, you can ask Adele or Madonna because they've both taken their tour too). The entire fleet is comprised of stunning wooden saloon boats-- all brimming with history (some almost 100 years old) and all still as beautiful as new. We took The Stern, which is their newest addition and designed specifically for the Amsterdam canals and havens. On board, we had a fully stocked bar, spacious + comfortable seating, a retractable roof if we needed quick rain coverage, and the most knowledgable and friendly skipper. I learned more about Amsterdam in those couple hours than I did the entire trip. After our tour we got to take a trip up to the top of the tower of their offices for my favorite view of Amsterdam! 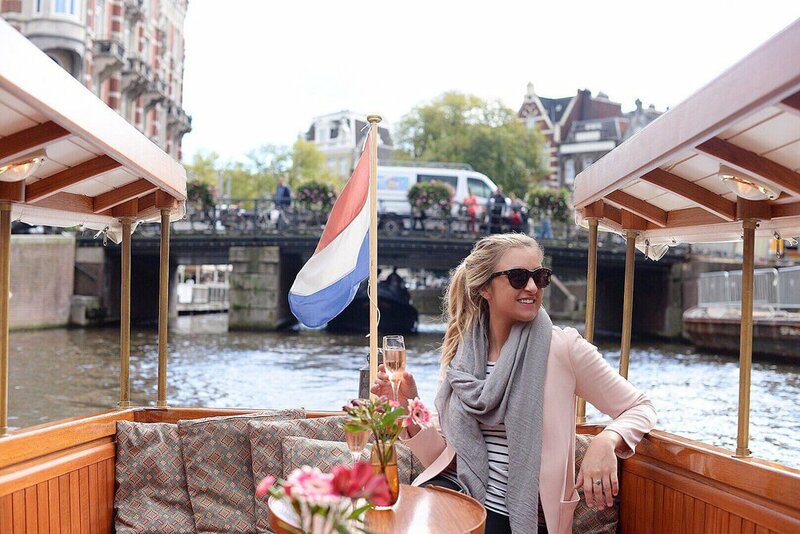 Private Boat Tours is well worth every penny you'll spend and will leave you with an unforgettable experience of Amsterdam... add it to the top of your list! You absolutely can't visit Amsterdam without visiting the Anne Frank House. Standing inside their hiding place made me think of so many things I never had before. How depressing it must have been without any natural light. How even flushing the toilet required strategy because the noise of the pipes. You could never be alone to cry- or just be alone period. It's no wonder Anne kept a diary to have a place for her thoughts. And can you imagine if she hadn't? The writer in me was so inspired by the power that comes with telling our story. While she was alive, she was just an ordinary girl. But because of her decision to consciously document what she experienced, she went on to impact the lives of millions. I can't even begin to wrap my head around what they went through, but I'm that much closer to understanding because of what Anne shared. And the power in that lesson compels me to be willing to share my experiences (no matter how petty in comparison) with others too. Don't miss this incredibly important piece of history. Buy tickets online in advance to avoid waiting in long lines (otherwise you definitely will). If you have a few days to explore, head over to Museumplein and you'll find the Rijks Museum and the Van Gogh Museum (as well as the infamous "iamsterdam" sign for photos). If you have plenty of time to see Amsterdam, consider yourself lucky. If you head to Dam Square, not only will you find the Royal Palace, but also The De Nieuwe Kerk Museum. Still wanting to see more sights? You can do a Red Light District tour that's lead by an ex-madam (if that interests you) or if you fancy a beer you can try out the Heineken Experience. Amsterdam exceed my expectations, and somewhere I'll definitely be going back. I can't say enough wonderful things about it and would advise everyone to book a trip of their own. You won't be sorry. Still want to know more? Leave your questions for me in the comments below!